Imagine you're learning a language that's so easy that you're having full conversations within just a few hours. The vocabulary makes sense, the grammar feels natural...it's all just very easy. You've found the holy grail of languages...the one that you'll find so easy that you'll master it in just a few hours. Listen to the latest podcast episode to hear Lindsay and me discuss this topic with lots of surprising insights and our own hit lists of top 5 easiest languages. Language Families: What Is Similar to What You Already Know? Familiarity is the most obvious way to guess whether a language is going to be easy for you to learn. The closer its structures and vocabulary are to your native language, the easier it should be to understand and learn them. The idea: Languages in your language family are the ones that give you the least new material to learn. With less to learn, that means you don't have to work as hard. It's easy! What You See = All You Get? The language families theory works perfectly, but it has one flaw: Without knowing about the languages you don't know...how can you tell that those familiar ones really are the easiest? For example, speakers of a Latin-based language like Spanish will list Italian and Portuguese as their easy languages... but fewer people mention Romanian. Romanian is less popular, but it is still Latin-based and fairly accessible. Many people start to mistake languages that are widely spoken with languages that are easy. And that makes sense in terms of access - how easy is it to find materials for your language? How unusual do you feel when you’re learning this language? But is the most popular language really the easiest? Maybe there's more to it! Language History: Where Have Languages Been Designed to Ease Communication? Sometimes, a language emerges because it needs to create ease of communication quickly and often this leads to simplified grammar structures. Languages designed to aid communication are Pidgins and sign languages, for example. 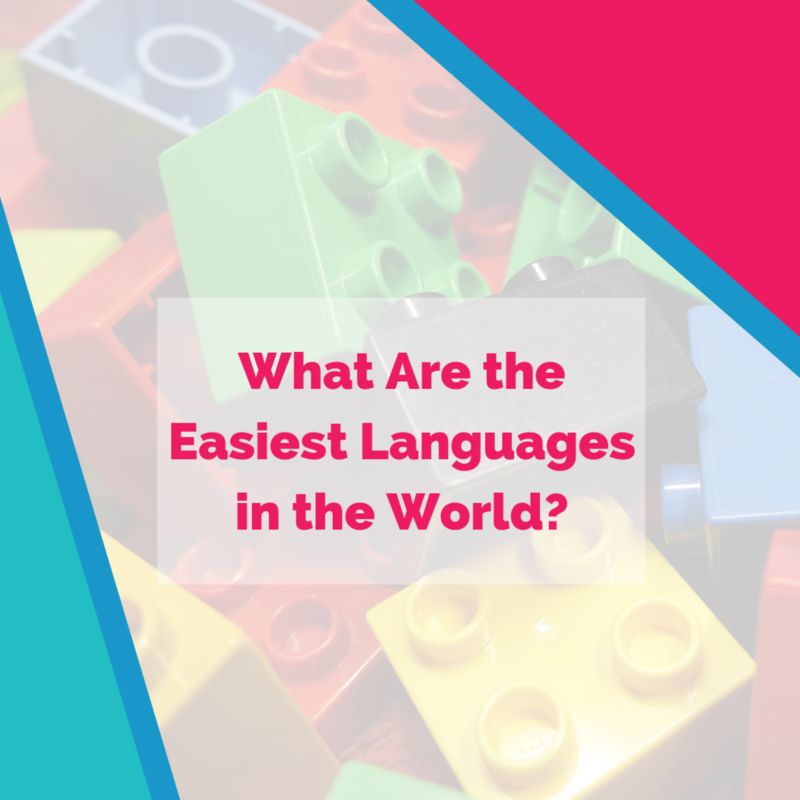 They’re considered easy partly because they are based on existing languages. In the podcast, we discuss whether a pidgin or a sign language could be the easiest language in the world...or maybe not? Learner Situation: Which Language(s) Have You Learnt Before? "I think the easiest three are often your last three, because you develop your language learning strategy as you work out which things help you learn"
It's very true. Languages can be easier or harder depending on you and where your skillset and mindset are at. A bad experience in the past (like in school) can give you the impression that a language is hard, when it may have been more to do with your learning environment. In addition to this, some languages just call to you and that motivation makes the complex grammar or weird vocabulary a joy to learn rather than a burden. So What Makes a Language Easy or Hard? It's personal to you as the language learner, so there is no general answer. What you know and the languages you know are also limited, so...in a way you won't ever have the answer until you try. But remember: It’s hard not to confuse “easy” with “available". What Were Your Top 5 Easiest Languages? Finding a good language teacher isn’t necessarily an easy task. For those who don’t have a lot of local tutoring options or for those learning a less popular language, it can sometimes feel impossible. Maybe you’ve had no luck finding teachers or language exchange partners in the past and you’re wondering if online teaching sites are a good idea. Maybe you’ve thought about trying one before, but didn’t know which option to choose. In this review, let’s take a look at what italki is all about, what it has to offer, and how to make the most of its features to help you connect with others. In short, italki is an online platform that connects language learners with both professional teachers and community tutors. Currently, there are over a hundred languages for learners to choose from, including German, Chinese, Catalan, Armenian, and Esperanto. Since all lessons are done online, there’s also greater chance you’ll be able to find someone who teaches a language you’d like to learn. Like lots of language learning resources, it sounds great, but how easy is it to use? Setting up an account only takes a few minutes and it’s free. After that, you can simply select a language from search bar to start looking for a teacher. One thing I liked about this process was the fact that I could review all the available teachers before commiting to a decision. Each teacher on italki has a profile with a video introduction, a short description, a list of their teaching strengths, a list of the type of lessons they offer, and different costs. Professional teachers will also have a list of education and experience. Once you find a teacher you’d like to schedule a lesson with, you’ll have to purchase italki credits, which can be done at any time from one of the options in the top menu. It doesn’t take long and there are a few different payment options, but keep in mind that each option has a different processing fee. After you’ve added enough credits, you can schedule a lesson. The booking process is simple and straightforward. Clicking ‘Schedule Lesson’ opens a window that lets you pick the language, lesson time, and lesson duration. New italki accounts have the option to select a 30 minute trial lesson, which is meant to help you get used to scheduling lessons and using the platform. It’s also great if you’re feeling nervous about your first lesson. You can use the shorter time period to test your connection, see how things work, and ask the teacher any questions you might have. Once you pick a date and time for your lesson based on the teacher’s availability, you can also select an alternate way to connect for your session, like via Skype. I’d recommend entering in this information since the italki classroom is currently still in beta and can experience glitches. After your lesson is completed, italki will ask you to verify that the lesson took place. If you did experience any issues, you’ll want to let them know. Then, you can leave a review for your teacher to share your thoughts on how the lesson went. How Can I Get the Most out of Italki? Do you want to learn a language in order to travel? Are you trying to pass a test? There are a lot of teachers on italki and they all charge a different rate. I found that knowing my own language goals was one of the best factors in finding a good teacher, not price. For instance, one of my reasons for learning Spanish is to have conversations with my Spanish-speaking, Latin American side of the family. So, when searching for a Spanish teacher on italki, I’m a bit more particular about finding someone who speaks Latin American Spanish and seems like someone I could easily talk to. However, someone who wants to learn Spanish to travel to Spain or needs to pass the DELE Spanish Exam will have a better learning experience with a different teacher. To learn more about what you get for your money, read How Much Will You Pay For a Language Tutor?. Even if you think you’ve found a good teacher, you never know what a lesson might be like. You could find it hard to talk to each other or you might not care for their style of teaching. Just remember that you won’t connect well with everyone. Don’t take it as a sign to give up. There’s nothing wrong with trying several teachers. One thing that helped me was to be prepared ahead of time. My most recent italki lesson was for Arabic, a language I knew almost nothing about. Before the lesson started, I wrote down a few initial questions and made sure I had a notebook and pen nearby. I think even this small preparation helped me focus a bit more during the lesson, even though I didn’t feel confident. Be conscious of any practical steps to need to take ahead of time as well, including finding a quiet room and making sure you have a fast, stable internet connection. It can go a long way in making sure your session goes smoothly. One-on-one lessons aren’t the only thing italki has to offer, but a lot of people either forget about or don’t bother with some of the other cool resources. Unter the Community tab of the main menu, you’ll find articles, a notebook to write things down in a language you’re learning, a place for questions and discussions, and a way to find conversation exchange partners. If you’re interested in improving your writing skills, you’ll definitely want to try the notebook feature. You’ll be able to post an entry in your target language and native speakers have the option to give you feedback and corrections. Similarly, you can check the Answers or Discussions pages if you have small questions or simply want to start a conversation. Any of these options is also a great opportunity to connect with others on the platform and find language exchange partners. So, Should You Give Italki a Go? Hopefully, this review has given you a bit more insight into how italki works and how you can make the most of its features to help you learn a language. My honest advice is to start by making an account and simply searching for teachers. Take a look at the costs and click the small heart symbol to bookmark any teachers that you think might be a good fit. I’ll admit that I nervously did that for a bit before I finally took the chance and scheduled my first lesson. The nice thing about italki is that you can just add a few italki credits and try it out. It’s not a big commitment, but it has a lot of potential to be extremely helpful. Overall, I found the site incredibly easy to work with and much better than trying to find a class or a private tutor to connect with locally. So, if you think it might be a good resource for you, try at least one lesson. I think you’ll like your experience. This review is part of a sponsorship from italki. It was written by Cassie Wright. To learn more about italki and get $10 of free lesson credit, go to www.fluentlanguage.co.uk/italki. Hello and welcome to Clear The List, “that was the busiest month” edition. This monthly language learning round-up brings together my progress from last month and my goals for the next month. What Happened in March 2019? I feel like the correct answer to this one is “everything happened”. First of all, the month of March kicked off with the best possible start as I co-hosted Women in Language with Shannon Kennedy and Lindsay Williams. The event was a big success, and we’re super proud to share that our online language conference brought in over 500 people from over 50 countries. Thank you so much if you were one of them. We cannot wait for the next Women in Language event! After those 4 days of fun, it was time for me to start the engines for my new online course launch. It’s actually happening this week. My new German course German Uncovered is out on Thursday, and you can peek inside the course by joining a free mini-course too. So that was a lot of course building and promo writing, talking about the German language and all round getting busy. The month was not over yet, as there was important work to do. Say what you want about the Brexit: it certainly takes up a lot of mental space. I went on the People’s Vote March in London along with a peaceful million others and Gareth from How to Get Fluent. So that’s a glimpse into March - a busy month! With all that was going on, we didn’t miss a single episode of the Fluent Show. One of my favourites was my interview with calm and centred language learner Nicole Miles, who shared rich insights into the deep motivations for learning a language…the kind that will fuel your progress long after the first weeks of excitement are over. And talking of being in for the long run, let’s see whether I squeezed in a lot of language practice. I’ve got to admit one thing right from the start: This month, tracking and lessons fell by the wayside and this makes today’s review a little harder. If I don’t keep track of what I do, I get to the end of the month with a vague sense of progress. Did I study? Didn’t I? Did you? No one knows unless we write this down. As you know, my current beginner language is Mandarin Chinese. My Chinese studies are progressing at a leisurely pace. After failing to find any Chinese self-study materials in the library, I decided to give the old 10 Minutes a Day another try and it’s been going fine in combination with the Drops app. This month I learnt numbers 1-20, consolidated the basics, and got a little more to grips with classifiers like 张 and basics like rooms in a house. I have a Chinese speaking acquaintance in my Coworking space and am rather proud that I was able to say “Excuse me, where is the house?” and they understood me. I’m very close to booking my first Chinese lesson on italki, but haven’t quite got the courage together yet. In the first two weeks of the month, Welsh took a step back as I worked on Chinese and Women in Language. But I started to miss it, so I feel like especially part two of the month was when I stepped it up. bump into my local conversation partner by coincidence. This Welsh element of surprise made me a much worse speaker - it’s so much harder to speak another language without warning. But I got there and this kept me practicing. I also said I’d finish Level 2 of Say Something in Welsh. And I did! I am very proud of this achievement. Finally, I continued to listen to the Mynd am Beint Gyda podcast, started watching the TV show “Fferm Ffactor” (a farm-based games show, what could be more Welsh! ), and got a habit of reading The BBC Cymru or parallel.cymru articles. Every month, I log my “daily contact” with the Welsh language. In total, March had 17 contact days out of 31 (and 12 of them in the last 2 weeks). I don’t track the length of each “contact”. In Chinese, I track a goal of “10 minutes” with the language, rather than daily contact. This is because I’m such a beginner that I feel a 2-minute Chinese session wouldn’t teach me enough. All in all, I tracked 80 minutes of Chinese during March. Since I use an app for this tracking method, it’s not 100% accurate. If you’re interested in a tracking template for your own language routine, check out the Language Habit Toolkit which contains two templates you can print or copy. I love April, it’s springtime and my birthday month! My habit of learning/speaking Welsh is now well established, as you saw in March where I actually started missing my language practice. Wonderful! I’ll trust myself to keep up the reading and listening by myself and will focus my goals on speaking practice. I must speak every week! Time to book more italki lessons and meet-ups with my local buddy. In Chinese, I’m slowly building up to my usual structure of listening, speaking, reading and writing as a goal structure. Let’s try it! I dabbled with Coffee Break Chinese for a little bit, but didn’t really fall in love with it. But with Chinese being a tonal language, it’s probably very important for me to listen to it lots. So here, my goal is to find and try some more materials starting with the Easy Mandarin series on Youtube. I can’t say much yet. My goal is to book an italki lesson but I’m not putting pressure on myself to do this at any cost. I’ll see if I feel like there would be any benefit. Most of my materials are written and that’s the core of my practice at the moment, so all’s well here. I just aim to learn more, really. My goal in Chinese is not about the characters at the moment, but I do find that I enjoy practicing a few of them here and there. The notebook is very helpful here, so my goal is to just spend a little more time practicing and playing here. As you can see, it’s possible to keep your goals light even if you do use the structure of listening, speaking, reading and writing. Have you ever tried it before? Be sure to check out the Clear the List linkup for #clearthelist, hosted by Lindsay Williams and Shannon Kennedy. So that’s it for this month. Leave a comment below to tell me all about how you’re getting on. What do you think of when you see the word “creativity”? For me, creativity used to mean being particularly gifted in visual arts. Painters and sculptors were creative. In school, it was clear that being creative was how you got good grades in art classes. I was a pretty terrible artist, and so I always assumed that I’m not creative at all. But then I got a job and started noticing things. In work meetings, ideas for alternative solutions to problems would bubble out of me. When I started teaching and learning languages on my own, I felt constrained by the ideas of learning with a textbook and classroom structure. Instead of putting off my ideas as delusions, I started to listen to them and put a few into action. And slowly I realised…I’m creative after all! My own discovery encouraged me to start looking differently at language learning. I quickly discovered that adults learn best when creativity and fun come along for the ride. So I started to seek out creative ideas of learning. If you are a first-time solo language learner who’s busy in her life and wants to know how to become fluent without sacrificing all your leisure time, creativity is what will get you to your goals. I know lots of people who start off and and think “learning is the books and the app”, and when you box your language learning in like that, your motivation suffers as a result. In this episode of the Fluent Show, Lindsay and I discussed the easiest ways to start building a fun and creative language routine. Warning: These may not feel like study, but you’ll learn a lot anyway. Research and discover songs in your target language and music from the target country. Learn new words and expressions by understanding the lyrics of the songs you listen to. It’s a common theme on this blog: We learn best when we’re having fun. Playing word games like Taboo, or even classic board games in your target language gives you a subtle way of creating a space where you learn a few new words free from pressure. Games are especially handy when you want to share your language with kids. You might think you have to be an advanced level language wizard before you can even touch a book of poems in your target language, but that is not true! Enjoy a story with tools like [Interlinear books], try your first ever haiku, or lose yourself in a rhyming dictionary. The key here is to express yourself freely and have fun in the process, getting out of your head and into the feeling that you want to have. It’s the 21st century, which means you’re more likely to be reading this on a phone than on a desktop computer right now. And that means it’s time to get creative with tech in your new language. Lindsay recommends creating a language space in social media that’s dedicated to learning your target language, for example a “Norwegian only Instagram”. I’ve tried this too through Twitter lists. The result is fabulous: it’s instant mini lessons, whenever and wherever you want them. Movement boosts memory! Have you ever thought about combining a language workout with a body workout? We had lots of ideas in the podcast, like example looking for exercise videos in your target language, and taking a language podcast out on a jog. This one’s great for teachers of any age group, too, as you can create a whole new lesson plan when you think about different ways of moving around your classroom (or outside!). For thousands of people, getting creative means creating cool craft projects like woodwork, scrapbooks, or small art. With craft projects, you have so many options of incorporating language. Of course you can search online for videos and instructions in another language. Or you could take printed items from the target country and use them to decorate your home. Or make special art pieces celebrating the words you love the most. Or create a photo essay based on inspiring expressions. Listen to the podcast to hear more about the special things I created as a teenager (Lindsay calls them ransom notes!). Everybody’s got to eat, and most people have to cook. So what could be more practical than cooking yourself a meal in your target language? From seaweed scones to the secret cuisines of Paraguay, we’ve tried this out and recommend it whole-heartedly. When it comes down to it, we found that it’s almost impossible to be anything BUT creative in language learning. Yet…many learners avoid getting involved. Or when we do play and enjoy in our target language, we feel guilty as if this isn’t “proper learning”. So this made Lindsay and me wonder: why the heck did school teach us that language learning has to look like classroom-exam-teacher-class-snoozefest? STUDY and LEARNING are concepts that feel like they should look a certain way, when in reality they are not. In the podcast, Lindsay and I looked deeper into this idea of permission and allowing ourselves to let go of language learning guilt. Guilt does not do us any favours at all so we should learn to let it go. How do YOU get Creative in Language Learning? Do you cook, craft, run, or rhyme with your target language? Or are you worried that these activities mean you won't learn anything? Leave a comment below and hare your thoughts! Women in Language is a special online conference for all language lovers, organised by Shannon Kennedy, Lindsay Williams, and me. In this article, you’ll discover more about how it all started and what it feels like to be at the conference. In this post, I’m sharing my language learning goals and strategies used in January 2019. And I’m starting to learn my 9th foreign language!